Cousteau was born on June 11,1910, in St. André­ de­ Cubzac, France. As a teenager he became intrigued by film and bought a movie camera. In 1929 he joined the French naval academy with dreams of world travel, and during his first year abroad he made movies of everything he encountered. After several years in China, Cousteau returned to France and joined the aviation academy. He was nearly killed in a car accident in 1936 and subsequently began a swimming regimen to rehabilitate his mangled left arm. Wearing goggles, he marveled at the beauty of underwater life in the Mediterranean. During World War II, Cousteau investigated new techniques for improving underwater film making. His first undersea documentary, Sixty Feet Down, appeared in 1942 and won praise at the Cannes Film Festival. Frustrated by his restrictive, heavy diving equipment, Cousteau collaborated in 1943 with Emile Gagnan to develop the Aqua ­Lung, an apparatus with an automatically regulated compressed ­air system. He used the lung while exploring a sunken ship, collecting footage for another movie, Wreck, which earned him a position with the French Navy’s Underwater Research Group. Cousteau sailed for the Red Sea in 1951. He and his team identified several unknown species, discovered volcanic basins on the sea floor, and, on their way home, discovered a treasur e­filled Roman shipwreck. In 1953 Cousteau’s daily logs were published as The Silent World, which enjoyed immense popularity. A second journey yielded a film version of his daily logs, which won a prize at Cannes in 1956. In 1957 Cousteau became director of the Oceanographic Institute and Museum of Monaco, filling its aquariums with rare organisms collected during his expeditions. That year he also initiated the Conshelf Saturation Dive program, which involved researchers living underwater for extended periods. The program led to his successful 1964 film, World Without Sun. Cousteau produced the acclaimed eight ­year television series, Undersea World of Jacques Cousteau, starting in 1968. The equally popular series Cousteau Odyssey followed. In the 1980s, Cousteau produced many oceanographic television documentaries that focused on his growing environmental concerns. He also continued to develop improved oceanographic equipment. He died in Paris on June 25, 1997. 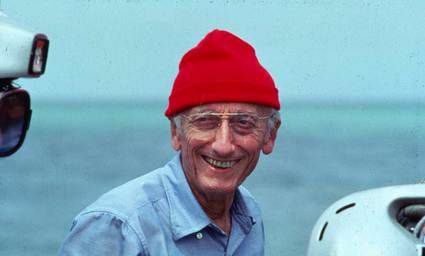 Cousteau’s technological contributions yielded numerous oceanographic discoveries, and his films helped to develop a worldwide concern for the marine environment. Diving equipment engineered by Cousteau led to expanded diving opportunities and the discovery of the complex ecosystems hidden in the deep sea, opening new areas of biological research. The Conshelf program allowed biologists to observe daily changes in natural marine environments over extended periods. The principles of Gagnan’s and Cousteau’s Aqua ­Lung can be found in modern scuba diving equipment. Innovations based on Cousteau’s principles, such as decompression schedules and carefully calculated gas mixtures, now allow safer and deeper dives, and dives in adverse conditions. Other oceanographic applications of Cousteau’s enterprise include the Sea Spider, used for biochemical analysis of seawater, and the Turbosail, used to reduce fuel consumption in ocean­going vessels. Industries such as offshore oil drilling were boosted by adopting Cousteau’s innovations. His lyric writing style and engaging film presence drew an enthusiastic audience and spread concern about the damage human activity wreaks on the ocean environment. His films, books, and television programs revealed the diversity of marine life and led to efforts to reduce marine pollution. In the 1970s the Cousteau Society, an environmental group focusing on both marine issues and world peace, was formed. His eldest son Jean­ Michel Cousteau, a prominent oceanographer, has been involved in his father’s projects since his childhood and carries on his father’s technological and environmental legacy. Posted on March 5, 2015 by Natalie. This entry was posted in Oceanographer. Bookmark the permalink.